This recipe was developed by the Tartine bakery to serve alongside their hot-pressed sandwiches. 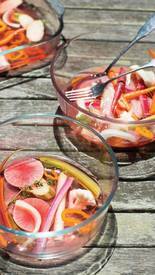 The pickled vegetables remain pleasantly crisp because they are only slightly cooked by the hot pickling liquid. They add a lovely spike of color and flavor to cured meats and grilled or roasted meats or poultry. They are also good on sandwiches or chopped for salads.